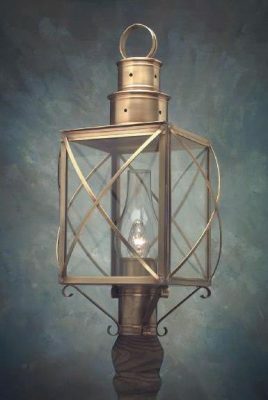 Each Reproduction Colonial Copper Post Light from Lighting By Hammerworks is solidly constructed in your choice of finish using the same methods employed by our colonial ancestors. The hand rubbed antique copper and brass finish gives the light fixture an attractive satin patina, which will oxidize naturally over time. If you prefer, we can apply a custom verdigris copper or black painted finish, to any of our reproduction colonial post lights.